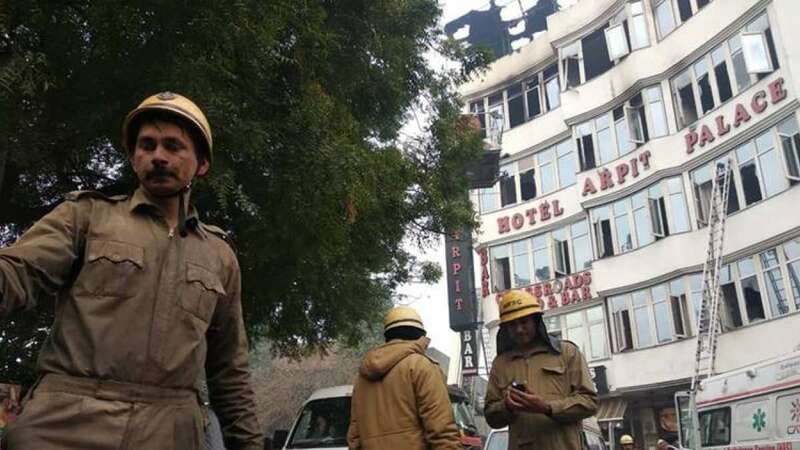 New Delhi : Massive fire outbreak at Hotel Arpit Palace in Delhi’s Karol Bagh area this early morning killed at least sixteen people including a woman and a child. 13 dead bodies are at Ram Manohar Lohia (RML) hospital. Five including one dead and four injured have been taken to lady Hardinge medical college. The fire broke out at around 4 am when the capital city was sleeping. Video recorded on cellphones by eye-witnesses showed huge flames crowning the terrace of the large, white building. A person is seen dangling from the terrace and then jumping off. The three-storey hotel, which had 35 rooms, was completely booked by a family which was in Delhi for a function, Garg added. Earlier, nine people were reported dead, but now, the death toll seems rising. For now, the fire has been brought under control. Investigation is underway to dig out the cause of sudden fire break out. Few days back, devastating fire broke out in the ICU of Metro Hospitals and Heart Institute at Noida Sector 12. According to officials, 66 patients were in the hospital, including 16 in the ICU, when the fire broke out around noon. No one was seriously injured and all the patients were evacuated, with most transferred to the hospital’s branch in Sector 11, a few hundred metres away.